Nick and that Beautiful Beast called Bone Cancer: I was a free man! On the night of the 4th of April 2011, I finally got home. To my own home, my own room and my own bed. It was frankly amazing to be home and simple things such as seeing my cat again and having a double bed again made me so happy. I don't think I've ever been so happy to be home! It was bliss. I was still very weak though and I could only eat small portions but I was slowly building my appetite back up. The reason my appetite was so poor was because while I was being fed through my port, my stomach was completely bypassed, meaning that it shrunk, so to suddenly start eating again came as a shock to my body and it would take some time for it to get back to normal. My consultant still wanted to see me, so every week I had to go with to Leeds for a check-up. I was still at risk of catching an infection or for my kidneys or liver to stop working, so I was confined to being with a few people at a time until my bloods were high enough. I wasn't properly allowed anywhere busy for the next three months. I tried everyday to get out and do something, starting with walks around my village. Being a bit lazy I often couldn't be bothered to walk very far but I started talking photos while I was out and I think in many ways I appreciated how beautiful the area around where I live is. Also it was sunny! I found this strange having been stuck inside from the beginning of March! Roughly a week after I had left hospital Sarah came to visit. We didn't really do all that much, mainly because I was limited as to where I could go but we spent ages doing this huge jigsaw Sarah had got me to keep me occupied in hospital, which we eventually got finished at about 4am one morning! We also went for walks around where I live a lot. It was amazing to see her again after the time before, when I'd been attached to a drip and very ill.
Sarah and I. I looked pretty pasty after a month of being in hospital! I also properly started to learn to drive, which in many ways was very strange for me. I could drive around Hull while learning but I wasn't allowed to get out in case of infection! I spent a lot of my time reading and I started doing more painting for once, now that I had the time! It was like being an old person haha! I saw many things differently after my high dose chemotherapy and Beth passing away. I realised that you only get to live one life and there's no point wasting any of it. I realised I have to make the most of it, because none of us are here forever. If you want something, go for it. I knew I was still very very weak and ill. Even a small infection could still kill me, but I also knew that I had to struggle through this to be able to live the rest of my life. 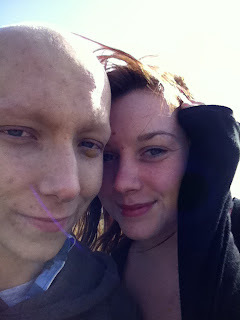 Cancer had taken 7 months of my life so far and it had also taken my friend's life. I knew that I would have plenty of time to make up for when I was well, and I decided I would grasp everything in life, take every opportunity, do everything 100%, never give up and to always try and do things that bit better. I also decided I had to give something back to all the people who'd helped me. I was told by my consultant that although I had finished my chemotherapy, as soon as my bloods were higher I would begin radiotherapy. The idea of this would be to kill off any remaining cancer cells in my main tumour. I was to begin this at the beginning of June, when my bloods should hopefully be high enough. Every time I have to be in the hospital for something with the cancer, it is always so amazing feeling to be back home!! Its the best! !